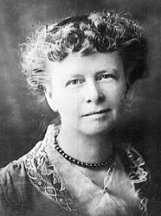 Eleanor Hodgeman Porter was born on December 19th, 1868 in Littleton, New Hampshire. She was educated in local schools, by private tutor, and subsequently at the New England Conservatory of Music, garnering praise for her singing through concerts and church appearances. In 1892, she married John Lyman Porter and moved to Massachusetts. Porter published her first novel, Cross Currents in 1907. Turn of the Tide, the sequel, was published in 1908. In 1912, Miss Billy was published and became an enormous best-seller. It was about an orphaned girl going to live with unknown relatives. Two additional Miss Billy stories followed and in 1913, Pollyanna, Porter's best-known book about an incurably optimistic girl, was also an immediate success. By 1920, there had been forty-seven printings, and the book was later made into a Disney movie starring Hayley Mills (1960). Two of Porter's other books, Pollyanna Grows Up and Just David (1916), were also on the best-seller lists. Porter died in Cambridge, Massachusetts, on May 21, 1920. The story of the eternally optimistic orphan who finds happiness at her new home with her aunt.